Formaldehyde: Whose problem is it? Formaldehyde affects each of us differently. Some people are severely affected even at small exposure level, while some are not affected at all. There are many negative health effects which can be caused by the formaldehyde. Most common complaints are eyes and nose irritation, sore throat, cough, headaches, nausea and difficulty in breathing and sleeping. Yet, the most insidious problem with formaldehyde is its ability to sensitive people to other pollutants. Once someone has been sensitized, they will begin to react to extremely small exposure level that previously was not a problem. The people who are most at risk are young children, elders, and pregnant women. High level formaldehyde emission are often found in a mobile house or conventional house that are constructed with large amount of low grade panels and engineered wood floor that we glued by high emission level urea formaldehyde resin. Consumers have choices to reduce the formaldehyde and other in door toxic pollution level in their houses. Some actions require considerable amount of investment, while some are not. One of the very easy ways is to replace parts of your house, which made from low grade particle board and hybrid plywood products with solid wood products. The key idea is to replace products that emitted formaldehyde (mostly found in glue) with products that are formaldehyde free. Using EO class particle board instead of the E2 class is also recommended. In conclusion, formaldehyde is the problem of both consumers and builders. and consumers became more aware of the indoor pollution issues and recognize their health as the ultimate priority, they are going to ask builders more questions and demand products that fit for their health. Aside from the business issues, several research has shown the possibility that formaldehyde and VOCs contain products can be more hazardous to installer than the householder. When considering healthful materials and technique, it is very easy to feel compelled to apply every available strategy and then conclude that healthy houses are simply unaffordable. If instead we assess the relative benefit of each action, we can determine which options to choose to create a health house with affordable price. For your convenience, we have list out improvement strategies and analyzed data based on the 80 sq meter sample area. The health benefit and implementing costs are then charted to display which healthful improvement return the highest value for your hard earn money. The relative health benefit is assessed considering the amount and location of pollutant materials along with the cost associated with strategies. 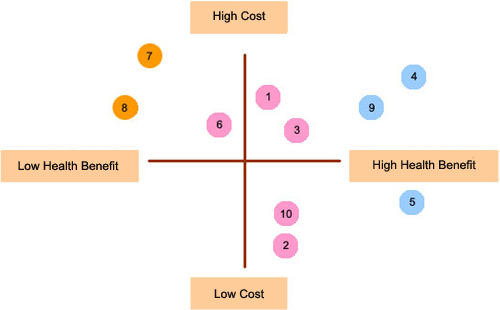 From the analysis, the strategies can be groups into 3 main groups based on the health benefit yielded from each action. Strategy no. 4,9 and 5 are grouped into this category. Although most of the strategies in this group required a sum of money, the health benefit could easily outweigh the cost for each strategies. The essential part of these strategies are to substitute engineered wood floors (contain formaldehyde), low grade particle board (contain high formaldehyde), and typical carpet (toxic fumes and dust cost mites) with solid wood products. It is also very obvious that cost for strategy no.4 (solid oak floor) is much higher than the strategy no.5 (rubber wood floor), while yielding the same desirable benefit. Apparently, strategy no.5 is the best choice and best value for your money. Strategy no. 6,1,3,2 and 10 are classified into this group. The cost of each action plan is varied, but mostly consider as low or moderate budget strategy. Strategy no' 10 and 2 are highly recommended in this group, since the health benefits are apparently better than other strategies at the lower cost level. Strategy no.6, 1 and 3 are almost indifferent since they gave almost the same level of health benefits at same investment bracket. So, any of these three strategies are worth to consider. Strategy no. 7 and 8 are strategies that yield small return to its investment. While the cost for each action is rather expensive, the benefits for consumers are not apparent to justify the plan. Replacing ordinary carpet with wool carpet does not rate highly though wool carper does not release toxic fumes. It still serves as a breeding ground for dust mites and dust collector. Also, natural or water based stain for exterior parts rate lower because they are outside the building envelope. Thus, it has little or no effect to the level of indoor pollution. The above three groups should at least give consumers a guide line on how to build a healthy house at the affordable price. There are still many strategies that we did not cover in our analysis. Each of them has specific benefits and cost associated with action plan. So, it is important for consumers to estimate and prioritize each option before fully committed to certain strategy. Estimating the health benefit is not an exact science. Researches on healthy houses still contained conflict opinions among experts. Yet all of us must make an educated guess as to the health benefits potential of each strategy and compare with its cost to find a right strategy.